The release of the electoral boundaries report is prompting questions not only about when the General Election will be held, but also about who will be fielded and where. While party slates will be confirmed only on Nomination Day, a look at where potential candidates from the People's Action Party (PAP) have been turning up could offer a hint. And a handful of them were out and about at constituency events yesterday, a day after the boundaries report was released. Spotted at a morning charity walk organised by Sembawang GRC grassroots leaders were Mr Ong Ye Kung, director of group strategy at Keppel Corporation, and corporate lawyer Amrin Amin. They joined Sembawang GRC MPs and over 2,000 people in a first-of-its-kind tribute walk in Woodlands to honour Singapore's first president, Mr Yusof Ishak. The event raised $104,000 through donations for the building fund of a $15 million mosque in Woodlands Drive 17, which will be named after the former president. Over at Cheng San Community Club, two potential PAP candidates mingled with residents from Ang Mo Kio GRC at a Hari Raya celebration. They were Temasek Poly- technic's School of Design deputy director Darryl David and colorectal surgeon Koh Poh Koon. All four potential candidates have been active in grassroots work. National Development Minister Khaw Boon Wan, who leads Sembawang GRC, told reporters that the party tries "to deploy our potential candidates so that they have actual ground experience... But will they be actually fielded here? We have yet to decide". Dr Koh and Mr Ong have experienced the heat of election campaigning, having contested before. Dr Koh lost in the 2013 Punggol East by-election to the Workers' Party's (WP) Ms Lee Li Lian. The experience has given him a "psychological prep" and has minimised the "shell-shocked factor", he said, adding that the ability to understand issues that are of concern to residents is also an advantage. 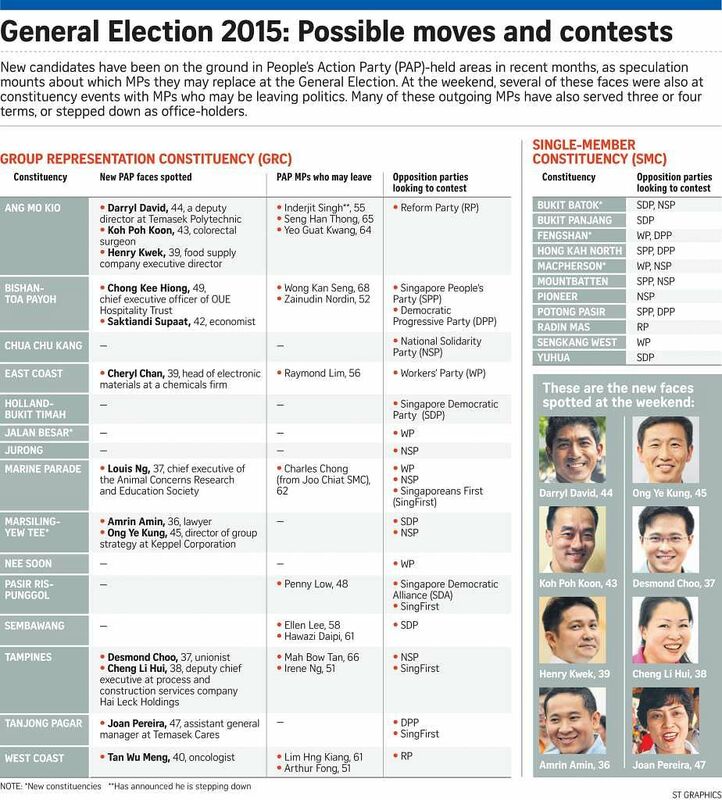 In the last general election, Mr Ong was part of a five-member PAP team which lost in Aljunied GRC, also to the WP. Whether or not they are involved in the next general election, which must be held by January 2017, the four said they are ready to do battle and are clear about how they can add value if they are fielded and elected.